This photo was taken on April 13, 2018 at 8:47 AM. The location was in Washington DC in front of a hotel in the drive in entrance facing the floor to ceiling glass front to the lobby. The "Take It!" 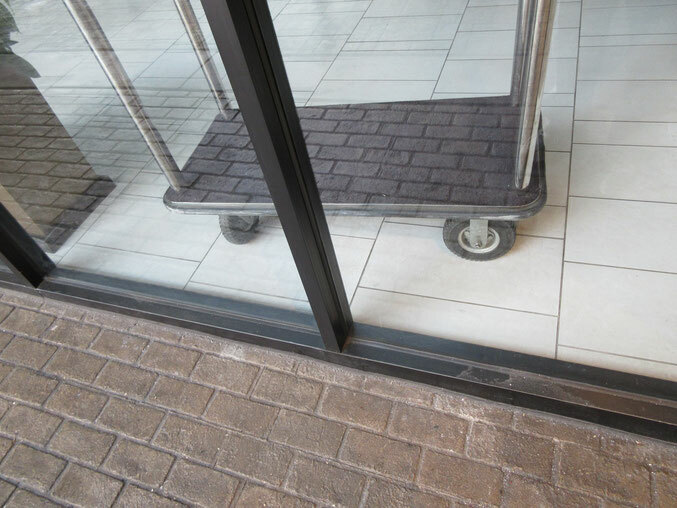 came without hesitation as I took in the reflection of the driveway bricks that had been transported through the glass window and landed upon the bell cart as a replacement for the existing completely different designed carpet upon it. I actually had to take a moment and walk around a few paces to take in what I was seeing. I took out my camera to take a photo of this, while my head was engaged in the quandary of if it would actually show up in this perplexing state. Fortunately it did. If ever I am standing there again and it appears, I will ask one of the doormen to explain to me how this one happens. Here is hoping their curiosity has had them find out - lol. Thanks for joining me in this little bit of overlay that helped make my day. Pretty cool! A brick-looking baggage cart, something you don't see every day...or ever! Our daughter didn't really get this one. She kept trying to explain that there weren't really bricks on the cart.